This evening began like any other Sunday evening. We had dinner. I mean breakfast for dinner. We read our scriptures together. We played a game together. We had family prayer. 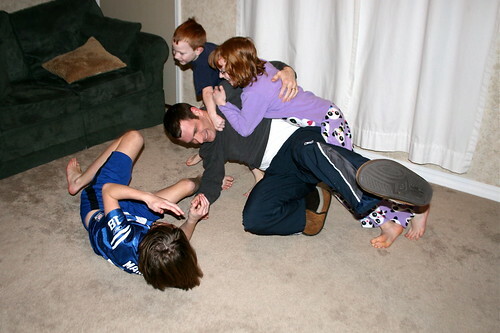 And then Kade wanted to wrestle. The most surprising part may be, for you not me, that Kade wanted to wrestle me, his mother. We've done this a few times in the last week or so. I let him think he's got me pinned only to flip him over and pin him. He doesn't like it when I tickle. I guess that's not allowed, along with fake biting/eating, but kissing him is. Back to the story, Kade jumped me as soon as we said amen. The game was on. We went a few rounds before he moved on to Mickey. I just couldn't resist tickling him. I guess he had enough. When Kade moved to Mickey the girls decided to join in too. I ran to get the camera thankful Mickey hadn't gotten to it first. Here are the kids trying to take Mickey down. I'm not bragging or anything but I got Mickey down in one move. I went for his weak spot. The ticklish one under his arms. He,he,he. He said I cheated. I don't agree. Can you believe it? Here it is, January 31st and I've made it through the first month of blogging everyday. I really didn't know if I could do it. There have been some days that I've regretted my goal but I pushed through that regret and found something to shoot and write about. I'm glad February is a short month. Then it will be March before you know it and Spring will be here soon. Yes!